This Sunday while you’re sitting in your local institutional protestant church, take out the hymnbook in front of you and open to any hymn. Read the lyrics carefully and ask yourself why the words talk about saved people as if they are still unsaved. If you look up the above hymn on Anderson’s Church Works Media web page, you will find the following under the heading “Doctrinal Notes.” I don’t think any commentary is needed from me. The words speak for themselves. But notice the authentic protestant orthodoxy of Law being the standard of righteousness in direct contradiction to Romans 3:21, 28! “The 4 verses focus on 4 major themes included in the doctrine of justification. Verse 1 addresses the hymn’s overriding theme of “The Great Exchange.” Jesus Christ was made sin for us in order that we might be declared righteous in Him. The great doctrine of imputed righteousness and unrighteousness grows out of a number of wondrous texts (2 Corinthians 5:21; Romans 3:19-4:8; Philippians 3:9) and is often pictured in Scripture by the exchange of garments (Isaiah 61:10; Zechariah 3; Matthew 22:1-14; Revelation 7:9-14). Hence, the theme of the song. “Verse 2 focuses on Christ’s active obedience—the fact that He mastered God’s Law in the place of sinners who could not, thus earning righteousness on our behalf. It was added essentially at the recommendation of my teacher and friend Michael Barrett, who has done a great deal to assist me in my understanding of justification. The key lesson here is that the righteousness imputed to me was Christ’s earned righteousness which He acquired by perfect obedience to God’s Law, not the inherent righteousness which He has eternally possessed by virtue of His deity. The great truth of Christ’s perfect obedience to the Father’s will and the imputation of that righteousness to repentant sinners is taught in Matthew 3:15; John 8:29; 1 John 2:1; Romans 1:17; 2:13; 3:22; 4:4-6, 11b and 5:17-19; 1 Corinthians 1:30, et al. “Verse 3 focuses on the grand doctrine of propitiation, the fact that God’s wrath was not merely deflected from us by Christ, but was rather absorbed by Him in our place. Jesus Christ bore the infinite wrath of God against sin, satisfying God’s wrath and enabling sinners to be forgiven—and justly so. Isaiah 53:10-11 describes it this way: God looks on the travail of Christ’s soul and is satisfied by it. His wrath has been exhausted on Christ. The doctrine of propitiation is taught Isaiah 53, Romans 3:25; 1 John 2:2 and 4:10, et al. “Verse 4 summarizes the hymn by describing the results of the Great Exchange—Christ forsaken and the sinner embraced by God. The role change of the sinner and Christ is amazing: the beloved Son of God was forsaken (Matthew 27:46) in order that the cursed enemy of God might be beloved (Romans 5:1-2; Hebrews 10:19-22; 1 John 4:9-14). Though I understand this doctrine biblically, I certainly cannot fathom it. It is astounding. It is wonderful. Isn’t it telling that a man who graduated from seminary and is leading his own church as a senior pastor needs assistance in understanding justification? So not only are the laity clueless but the leadership is as well, and here is one who comes right out and admits it! I patently reject the premise of this meme that believers are metaphysically the same as the unregenerate. The Bible states unequivocally that believers are the literal offspring of God via the New Birth! This means that believers are indeed “perfect” because they are righteous just as the Father is righteous! 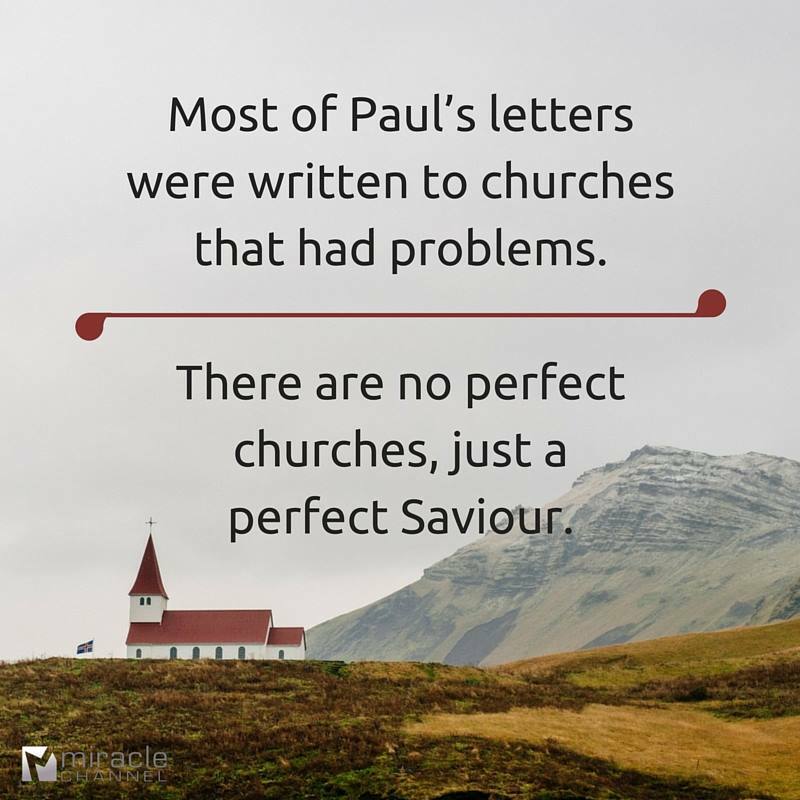 And since the assembly (“church”) is the Body of Christ made up of individual believers who are “perfect”, then it stands to reason that the Body of Christ is “perfect” as well. But notice the implication that the “church” is a place or an institution and not a Body. Furthermore, that any evil found in the institutional church should get a pass, because after all, we’re all just totally depraved sinners. As the meme suggests, believers therefore require the perfect obedience of Christ to “cover” present sin in our lives. Overall, it is just one more example of Protestantism’s denial of the New Birth as real change. 1. Total Depravity: Pertains to the saints also. 2. Justification by Faith Alone: Pertains to sanctification also. 4. Double Imputation: Christ’s passive obedience to the cross for justification, and His active obedience as a substitution for our obedience in sanctification. 5. Deep Repentance (aka Intelligent Repentance): Seeks the death of mortification in re-experiencing our new birth. 6. New Obedience (aka New Fruit): The experience of Christ’s active obedience in sanctification (vivification). 7. The New Birth: Perpetual mortification and vivification. 8. The Objective Gospel: All reality is interpreted through the redemptive works of Christ. 9. Christ for Us: Christ died for our justification, and lived a perfect life for our sanctification. 10. The Imperative Command is Grounded in the Indicative Event: Biblical commands show forth what Christ has accomplished for us and what we are unable to do in sanctification. Works are experienced only as they flow from the indicative event of the gospel. 11. Neo-Nomianism (New Law, aka New Legalism): The belief that we can please God by obeying the law in sanctification. 12. Progressive Sanctification: The progression of justification to glorification. 13. Progressive Imputation: Whatever is seen in the gospel narrative and meditated upon is imputed to our sanctification, whether mortification or vivification. 14. The Golden Chain of Salvation: See cut 12. 15. Good Repentance: Repenting of good works. 16. In-Lawed in Christ: Christ fulfilled the law perfectly and imputed it to our sanctification. 17. Redemptive Historical Hermeneutics (the Christocentric Hermeneutic, aka the Apostle’s Hermeneutic): The Bible as historical narrative for the sole purpose of showing forth Christ’s redemptive works. 18. Faith: A neutral entity within us with no intrinsic worth that is able to reflect the object of its focus outside of us. The object of focus can be experienced within, but remains outside of us. 19. The Heart: The residence of evil desires and faith. It can be reoriented (the “reorientation of the heart” or “reorientation of desires”) to reflect Christ via mortification and vivification. 20. Flesh: The world realm where evil is manifested and experienced. 21. Spirit: The Spirit realm where the imputed works of Christ are manifested and experienced (not applied through our actions). 22. Christian Hedonism: Seeks to experience the joy of vivification. 23. Obedience of Faith: New Obedience. 24. Christ in Us: “By faith,” and faith only has substance and reality to the degree of the object it is placed in; i.e., Christ outside of us. 25. Vital Union: Makes experiencing the gospel possible. Makes mortification and vivification possible. 27. Sabbath Rest: Sanctification. We are to “rest and feed” on Christ for our Christian life. The primary day this is done is Sunday. Through preaching and the sacraments we “kill” (mortification, or the contemplation of our evil and misery) resulting in vivification throughout the rest of the week. 28. The Subjective Power of the Gospel: The manifestation of the gospel that flows from gospel contemplationism. We never know for certain whether it is a result of our efforts or the Spirit’s work (although the Spirit’s work is always experienced by joy); hence, the power of the objective gospel is subjective (Heidelberg Disputation: Thesis 24). 29. Mortal Sin: Good works by the Christian not attended by fear that they may be of one’s own effort (HD 7). 30. Venial Sin: Good works by the Christian attended with fear (HD 7). 31. Power of the Keys (aka Protestant Absolution): Reformed elders have the authority to bind or loose sin on earth (Calvin Institutes 3.4.12). 32. Redemptive Church Discipline: In all cases to convert one to cuts 1-31. This redeems them to the only one, true faith. This can be a long process, and said person is not free to leave a given church until the elders bind or loose. 33. Preach the Gospel to Yourself: See cuts 1-32.